The skiff cracked skim ice as our duck-hunting party worked the oars to push through the cypress swamp of Beaver Dam Lake. Dawn infused the mysterious atmosphere with Mississippi sapphire light while a hand-held torch illuminated the murky water oozing up through the fissures. Our destination slowly materialized as an apparition in the mist. It was a blind, the weathered plywood camouflaged by scavenged, gnarled branches, perched atop stilts, medieval and mesmerizing. An outdoor writer and pioneer conservationist, “Mr. Buck” wrote nine books and hundreds of magazine articles. His home-spun style of storytelling bestowed legions of American hunters with humanity, humor and deep respect for animals during his career that spanned most of the 20th century until his passing in 1971 at 91 years old. Mr. Buckingham’s book “De Shootinest Gent’man” published in 1934 by Derrydale Press featured a collection of stories that bestowed waterfowling with an entertaining Southern voice that resonated with American sportsmen. The title story, written in 1916, helped establish his reputation as an iconic outdoor writer. If ever there lived a natural-born duck hunter, Mr. Buckingham easily claimed that distinction. His father, Memphis banker Miles Sherman Buckingham, achieved prominence as a founding member of the Beaver Dam Club in Tunica, Mississippi. Chartered in 1883, the defunct hunt club had been recognized as one of the oldest in North America. By the late 1800s, the young boy hunted with Southerners who lingered in his heart as fanciful influences. During the 1900s, Mr. Buckingham rode the train two hours from his hometown of Memphis to Evansville — the jumping off point for reaching Beaver Dam Lake. 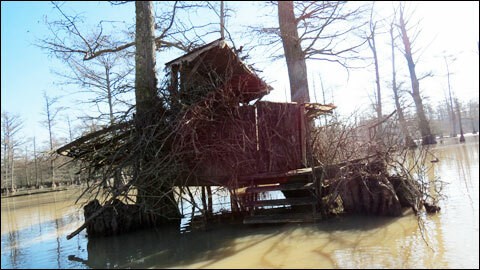 His published tales of duck hunting immortalized the flyway honey hole and its roust-about cast of locals. By some accounts, Mr. Buckingham’s writing may have been surpassed by his marksmanship. He reveled in mastering extremely high shots with the 10-pound, 12-gauge Super Fox nicknamed Bo Whoop after its hollow eruptions. Now, 41 years after the passing of Mr. Buckingham, Robert Milner, Jr. has embarked on his own inspired ventures that pay homage to the legend. 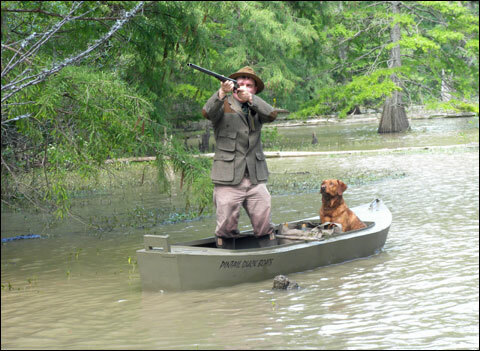 Like Mr. Buckingham, the father of Mr. Milner, Jr. is a moving force in the local duck-hunting community. The elder Mr. Milner was also a member of the Beaver Dam Club. A world-renown dog trainer, he started the famed Wildrose Kennels in nearby Grand Junction, Tennessee. He subsequently launched Duckhill Kennels in Somerville, Tennessee — some 30 miles east of Memphis. The Milner men summon ducks from the Nash Buckingham Rod and Gun Club blind on Beaver Dam Lake. It seems inevitable that Mr. Milner, Jr. was destined to start the new Nash Buckingham Rod and Gun Club on the shores of Beaver Dam Lake. And the same swamp-water DNA has made him heed another calling — the creation of a classic duck hunting boat aptly called The Nash based on Mr. Buckingham’s famous aluminum vessels. Unfortunately, The Nash number one wasn’t completed in time for our hunt and so the skiff that awaited us at the pier patiently advanced toward the blind reserved for members of the Nash Buckingham Rod and Gun Club and their guests. Our four-man party included Mr. Milner, Jr., his father and John Hoffman, Photo Editor for Ducks Unlimited based in Memphis. The blind that belongs to the Nash Buckingham Rod and Gun Club. Upon arriving, we stepped up from the boat into the spacious blind, stowed our gear and situated Mr. Milner’s British Labs, Boomer and Tex. 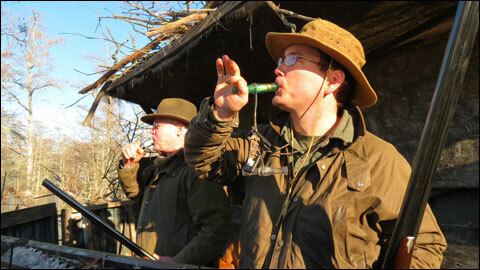 Both Milner men shared an affection for duck hunting with vintage shotguns. Senior favored a 12-gauge Gibbs hammer gun, while his son packed a 12-gauge Parker VH. My duck gun of choice was a 12-gauge Ithaca Waterfowl pump that proved silky smooth and accurate. Mr. Hoffman, meanwhile, devoted his time to photographing. Then Mr. Milner, Jr. and Mr. Hoffman glided into the lake again spreading decoys. 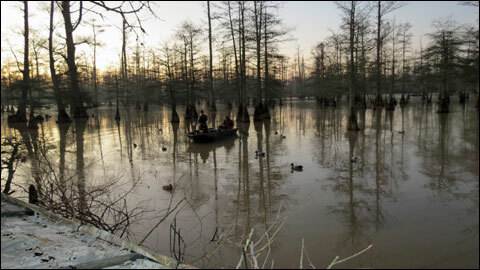 Robert Milner, Jr. and John Hoffman lay out decoys at sunrise on Beaver Dam Lake. The earth turned slower in the cypress swamp of Beaver Dam Lake. Legacies ripened here to the rhythm of tidal flows from the Mississippi River. A trace of magic prevailed. The decoy spread befitted a mystical amulet afloat on the tranquil surface. What could possibly come of it? In June 2012, Mr. Milner, Jr. discovered a real-estate ad on Craig’s List for an extraordinary section of land on Beaver Dam Lake. Milner elder and junior in the warming shed of the Nash Buckingham Rod and Gun Club. By July, Mr. Milner, Jr., who sells warehouse automation systems full time, had attracted eight other members who formed an LLC to purchase the property, including the blind and pier. Christened the Nash Buckingham Rod and Gun Club, most of the nine members are investment bankers from Atlanta and Memphis. Membership is closed until someone sells their share. 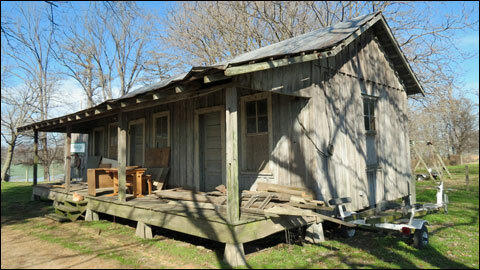 Two ramshackle buildings from the 1930s remain in service despite their tattered appearance. The tack room of a mule barn has been converted into a no-frills warming shed with old lockers and furniture. A commissary that once sold hardware and groceries is used for storage. Except for a discrete sign that reads “Nash Buckingham Rod and Gun Club” on the barn, the rustic outpost on Beaver Dam Lake looks unmolested by modern hands. “We’re trying to keep it simple, like back in the old days,” said Mr. Milner, Jr.
With the club fully operational, Mr. Milner, Jr. could turn his attention to another new venture called Beaver Dam Mud Runners. The company sells stealthy duck-hunting boats, its star model called The Nash inspired by the Alumacraft Ducker favored by Mr. Buckingham. Robert Milner, Jr. and Boomer in the new Beaver Dam Mud Runners’ Nash duck boat. The Nash is made of .10 thick aluminum, with all seams welded. At 11½ feet long and 40 inches wide, it’s designed for two people with propulsion intended by a trolling motor. Mr. Milner, Jr. turned to local boat-maker Chris Downs of Pintail Duck Boats to make The Nash exclusively for him. Prices for The Nash start at $3,200. The Layout is constructed of .090-inch, 5052 aluminum. Mr. Milner, Jr. says the all-welded boat is extremely durable. With a length of 9 feet, 9 inches and a bottom width of 28 inches and a beam of 35 inches, the 60-pound boat can easily slide into the bed of a pick-up truck. A raised transom accommodates trolling motors. It’s spud pole compatible too. The Beaver Dam Mud Runner Layout costs $875 in olive drab. Camo is available for $75 extra. The Beaver Dam Mud Runners’ Layout Boat. 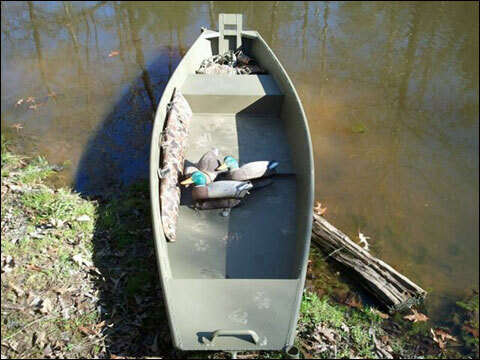 There’s also the Beaver Dam Mud Runner Sneak Boat. Built with a .100-inch 5052 aluminum hull and a .063-inch top skin, they can be ordered either 10 or 12 feet long. The smaller boat sells for $3,300 while the longer one is priced at $3,400. They come standard with a Grab Bar. The boats share a bottom width of 36 inches and a beam of 48 inches. A high rake bow and a huntable cockpit keep you concealed. These are designed to accept mud motors or outboards. Weight is 180 pounds for the 10 footer. Olive drab can be replaced with camo for $125. The rugged, shallow boats were ideally suited for the low water levels that we believed diverted the ducks elsewhere that morning. Beaver Dam Lake still suffered from the devastating summer drought of 2012 that endangered barge traffic on the Mississippi River, whose tributaries fed the lake. From the blind, high water marks from better days stained the tree trunks. By our reckoning, levels were down some three feet. The original Beaver Dam Club. The morning mist lifted revealing virgin, sunlit blue. Intermittent shotgun blasts echoed through the swamp, but the few ducks we spotted stayed forlornly out of range, except a teal that approached the spread. A single shot with my Ithaca and Tex was soon in the water retrieving. If indeed duck hunting is 99 percent b-s-ing, that’s how we passed the time beneath an empty sky. By 11 o’clock, lunch beckoned. Our destination: the historic Blue and White Restaurant out on Highway 61. Besides Beaver Dam Lake, the Blue and White Restaurant stands as a touchstone to the halcyon duck-hunting days of Mr. Buckingham. The prominent, blue bow-tie shaped sign with its big, red arrow pointing at the building harks back to the building’s original owners, the Pure Oil Company. To this day, the cottage resembles an old gas station and café from the 1930s. 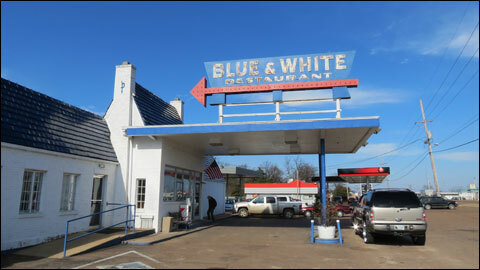 The Blue and White Restaurant. Inside, there’s the blue-and-white checkerboard floor, lunch counter and Formica-topped tables vivid in the bright dining room. Men in waterfowl camo were everywhere you turned. Waitresses expertly crisscrossed the restaurant serving the likes of country fried steak, pulled pork, frog’s legs, BLTs, catfish creole and chicken livers. 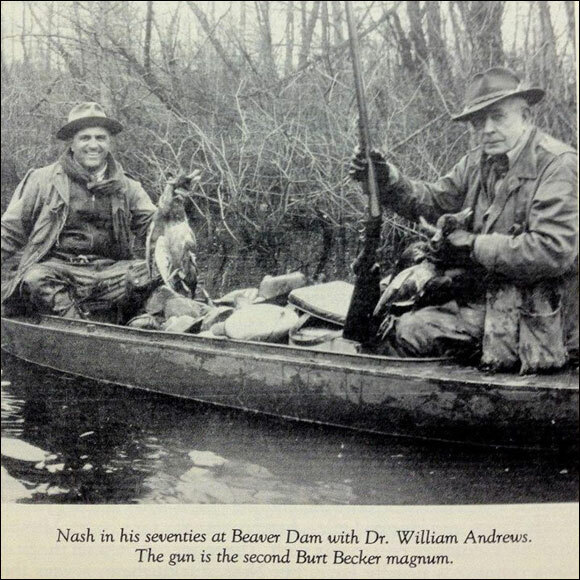 Of the Blue and White, Dr. William “Chubby” Andrews wrote in his book “Nash Buckingham, Beaver Dam and Other Hunting Tales,” During the fifteen or more years that Mr. Buck and I shared great days together at Beaver Dam we would often resort to the Blue and White. Here we would always order the luncheon special. 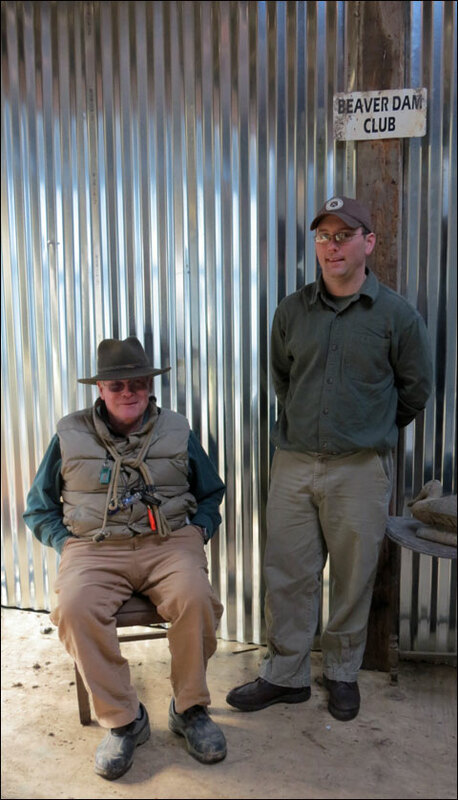 We would often be joined by local planters, and conversations about the duck flights, conversation measures, certain duck loads and their effectiveness, and always questions as to Mr. Buck’s secrets rising to the occasion and giving stimulating and humorous answers to the many questions. Right when you enter the restaurant, a conspicuous buffet exhales the perfume of fried food. After shown to a table we lined up at the long steam table behind tradesmen, tourists and duck hunters — packing plates high with fried chicken, fried catfish, fried green tomatoes, fried salmon patties, mac-and-cheese and banana cream pie. The proper Southern fare with a mug of black coffee elevated spirits and lubricated our conviviality.